with her mom in arms. In 1982 when I got involved with the idea of conscious parenting education. I was a young drama actress, playing in the theater in Moscow. The more I learned about it, the more I wanted to be involved. It started when I was invited to my friend's birth. She gave birth in her apartment in a tank full of water. This experience of being present at a birth shook all my being and changed my life. I witnessed how this event turned into the peak of people's total trust, their togetherness, closeness. They both were in the water. He was holding her like a chair, massaging and kissing her. She was silent as never before, very deep in meditation, with a divine expression on her face. When the baby emerged, not one muscle moved on their faces, but everybody else burst into tears of happiness. It was happiness in its divine essence, and this feeling was repeated for me at every birth I attended later. The whole thing started from the idea of giving birth in the water, and developed later into a full, beautiful and intensive program of preparation during pregnancy, which starts even before the conception. It contains a variety of purification techniques and meditations for both partners. In nine months they gain enough self-confidence to deliver their baby at home by themselves, or maybe inviting a friend to help with the baby afterwards. This would be a decision of very mature souls, who are able to take full responsibility. Giving birth is such a basic thing in human life! I think that the new tradition of escaping from this responsibility is one of the major traps of our strange civilization. Of course, this is not appropriate for everybody. I saw statistics published about people's reactions to learning that they have cancer. Sixty percent of these people start following their doctors religiously, doing exactly what the doctors ordered. Twenty percent give up right away and start preparing for death. Another twenty percent start looking for alternative ways to survive. The same statistics are true about expectant parents — approximately twenty percent are interested in home birth. Birth is a hologram. The quality of birth reflects the quality of the awareness that a woman has. The more conscious she is, the more conscious is the way she gives birth. It has nothing to do with college degrees, I mean intellectual education. In Russia I collected statistics about the midwife's way of giving birth. It was worse than in any other professional group. It has to do with being in tune with the inner self and the whole world living in peace. The main thing here is that the quality of birth depends on the couple's attitude — how much responsibility they want to accept for the entire event. Sometimes it is necessary to meet with the couple's parents to work out some tension. For example, a negative attitude of the mother toward the decision of her daughter to give birth in the water, or even simply to give birth, will create difficulties during the birthing process. Even if a woman and her partner didn't have enough consistency to clarify the psychic atmosphere during pregnancy, the birth itself is a great opportunity for clarification. A woman is able to dissolve many of her own blocks and limitations which otherwise could take her the rest of her life to resolve. If she consciously uses the tremendous energy of birthing available to her, she can accelerate this usually lengthy process. The first thing is not to be afraid. If for some reason the contractions become weaker and weaker, this is it! Divine moment! Ask yourself what is the reason why it's not going smoothly? And relax as deeply as you can and let the answer come into you consciousness The first thing that will come up on the surface of your memory will be the answer. It could be some situation when you hurt somebody or somebody hurt you, or a previous abortion, or a lie, or old unhealthy relationships that keep taking energy away. Birth is a hologram of all your life. Whatever will come up is the subject of your undivided attention for the next few minutes. Recall this situation in all details, very emotionally. And then, forgive. Forgiveness is the key here. Forgive yourself and whomever is involved. And ask them to forgive you. And the divine energy of birthing will give you at that moment enough power to turn the switch, to experience the liberating feeling of letting go of dead connections and all that grief that became a habit to carry around. First time I witnessed a woman doing it, it brought tears to my eyes. The process that otherwise would take her years to go through, (she had so much grief in her heart) takes a few seconds at birth. It is an extremely concentrated few seconds. And then the birth went smoothly for a while until she hit the next wall. And she kept surfing those waves of strong emotions,recovering her attention in the situations from her past when she gave her power away and re-writing her life's script, untill she claimed all of her power back and had an amazing experience of profound grace as she birthed her baby! The energy of a baby's emerging is available to women only a few times - even once in a lifetime, if it's an only child. It makes sense to fully experience it, to use it to accelerate spiritual growth. It is so powerful that involved people, if they are consciously facing this energy, are able to experience unknown levels of freedom and real happiness. On the other side, if any of the participating people (her husband, midwife, doctor or her girlfriend,- whoever is present at birth) are unaware enough to turn their backs to this power, to ignore it, or if they had not dealt with their own birth trauma and struggle themselves with their own unconscious resentment to being in the body on our planet Earth, it may cause the opposite effect — make them sick, emotionally and physically very tired and upset with all their life circumstances. And it will, in turn, affect the birthing field, bring the struggle and delay into it. Overall, the less people are present, the better. To give birth or to witness it has been for me the great opportunity to get in touch with things I forgot about myself: with my ancient nature, my wild wilderness. The pain is not an excuse to give away control of the process. There are ways of working and cooperating with pain. When you are not a victim, but an empowered participant, you use this pain as a purification tool. You take the sharp end of this pain and move it all over your body, burning up, as fire burns up hay, all negativity in every part of your body, fully concentrating on this cleansing. Then the pain doesn't hurt you. And after it is over, you will feel like a newborn. This technique is good for all kinds of pain, not only birth. The work of American psychologist Stan Grof reports that 97 percent of 10,000 investigated criminals experienced a heavy birth trauma. Grof created theory about four prenatal matrixes. The most dramatic is the third matrix. This is when, during the birth process, the baby's head is kept for a long time under great pressure in the birth canal. According to Grof, this is the time when all the negativity of the future personality originates (fears, anger, aggression). The longer the head of the baby remains in this shocking pain, the more fixated this person will be on their fears. And fear creates anger. Looking at our angry, uncivilized civilization, I thought why don't we try something different? For example, start with minimizing the birth trauma and making the birth process as short and joyful as possible. 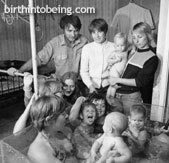 Since I982 I have been able to watch the children whose parents were involved in the conscious birth movement in Russia. They are very healthy, smart, strong and natural leaders. But there is more: they don't have fear in their eyes. When I was a child I remember that all my playmates and I had a lot of big and small fears. And it never goes away without special effort. It shows. The great majority of people keep carrying our fears, that originated at birth and then grew up like a snow ball, supported by unconscious parents, and knowing no way to get rid of it. We hide behind keeping ourselves extremely busy or angry or doing drugs, continuing ignoring ourselves. It is our duty as parents to set our selves free and protect our children from our patterns of behavior where actions and lifestyles are coming out of fear. Also, these children take good care of their parents. These families have few divorces. Needless to say, there is no child abuse and no unwanted pregnancies. Their life is full of joy! I personally think that being spiritual means to be able to enjoy life, I realized that we don’t have to suffer! To enjoy doesn't mean that life should be easy. I mean, enjoy the process, remembering that it was one's Choice, whatever one is facing. There would be a library and video library there. And a little health food resturant, the talk of the town... Why not? We can have this in every vilage in the world, if we reduce our military spendings by one gazillionth! Let's do that, people! P.S. I wrote this article in 1993, when my English was brand new. I came to America in 1989 on Halloween night. I knew how to say: “My name is Elena”, that’s about it. So, please forgive the coarse places! It was a plea for the community support and our local newspaper published it!